Is the bug mesh on your screen door enough to keep mosquitos out? With the warm winter and early spring this year, many are annoyed and worried about the early onslaught of hornets, mosquitos and other dangerous insects. Unfortantely, many assume that their screen door or custom screened enclosure has the right screen to keep bugs out. But unless your screen door or screen room has a bug mesh grade screen, the fact is that your screen might not keep those biting insects out. Who should be most concerned about an insect-proof screen door? 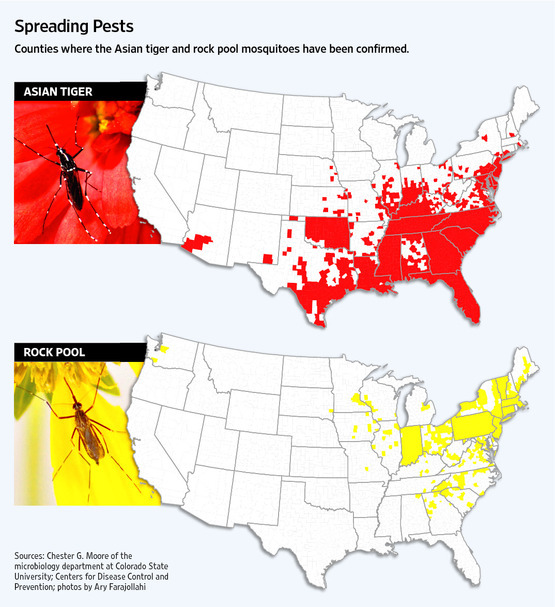 According to the University of Colorado and the Center for Disease Control, areas of the country highlighted below are most in danger of the onslaught of rock-pool and tiger mosquitos. Not only are can these aggressive biting insects cause irritating rashes and itching, they also can carry life threatening diseases like West-Nile virus and dengue fever. Bug mesh screen is just one factor if you are considering a screen door replacement. The mesh of your screen is not the only thing that can let biting bugs in. If your screen door sags it opens a gap that allow bugs to come in. The sweeps and stops at the bottom of your door can dry out or rot, creating additional gaps. Or if your screen door is in a high traffic area from children or pets, the wear and tear and cause screens to pop out, or rip. If you live in one of these areas, ask your screen door supplier or home improvement center how the screen door they carry holds up. Or let us know who your local screen door store is and have PCA Products in your neighborhood!